The Hero's Tale - Family Friendly RPG: STORY BOOK! DeFrantis is a young human girl living on the streets, trying to eke out a living in the sprawling city, and she has problems. First, after a botched attempt to steal a chicken, she’s on the run. Second, for some reason, someone other than the City Guard is trying to hunt her down. Finally, the poor kids she was trying to feed got sold off to slavers. She has to save them, but first, she has to find them! Along the way, she gets help from strangers: Antonerri, a soldier turned heretic - Thissraelle, an elven mage girl; Granthurg, the studious giant; and Karendle, a half-dwarf wizard wannabe. ...But who is the Dragon’s Flame? 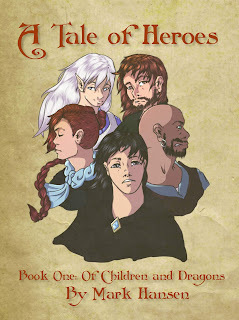 Get the first two story arcs of "A Tale of Heroes" in one printed (or ebook) volume! Available now at Amazon! Learn how to get the book with no money up front!